Use visual knowledge of results and note balance to guide swing improvement. Sensory motor learning is the process of learning physical skills using cues that require one or more of your senses, such as hearing, feeling or seeing. The most obvious sensory cue for improving your golf swing is sight. If you are a right-handed golfer trying a new grip and the ball flies to the right, you know this grip causes a slice. In addition to using visual cues, noting your balance during your swing and its effect on your shots is helpful. Practice your swing on a driving range with targets, such as flags or marker signs. Seeing where your ball lands in relation to where you aimed it provides you with extrinsic, augmented feedback that is critical to motor learning. Warm up by starting with short irons, progressing to longer irons, high-numbered woods and finally to your driver. As you warm up, note your balance on each swing. On long shots that feel good to you, you should feel balanced, with your weight shifting onto your front foot and the heel of your back foot coming off the ground at the end of your shot. Note your balance when you hit the ball straight. When you are on balance, you better control your club, allowing you to swing the club in a straight path. 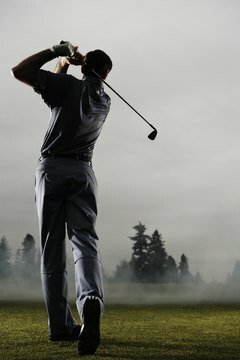 When you fall backward or take a step to the side as you hit, you will top, whiff, slice and hook the ball. Practice one shot with the same club from the same lie, aiming at a particular target. Use your knowledge of results--where the ball lands--to gauge the effectiveness of the shot. Adjust your swing, grip, stance or ball placement and try again to see the effect your adjustment has on the flight path of the ball, again using where the ball lands to provide feedback. Note your balance each time you hit the ball, on both good and bad shots. Alter your technique during practice swings--change your grip or stance and swing without hitting a ball. You may also practice the new techniques while hitting balls into a net directly in front of you. This type of practice provides no feedback or sensory motor learning, but it allows you to alter swing mechanics without worrying about results. Practice your swing with the new technique, this time hitting balls at a target to see the effect it has on your ball trajectory, flight path and distance. Note your balance during each swing, and how different balance affects your results. Change clubs after every six to eight swings once you feel you have the correct technique. Finish your practice only after you were able to hit the ball correctly each time you switched clubs.